So George, where did it all go wrong? The hotel bellboy who delivered champagne to Best's room and found him entertaining a scantily-clad Miss World on a bed covered with his winnings from the casino. George Best provides some dark humour about his addiction. The telegram sent to Manchester United by talent scout Bob Bishop, who discovered a 15-year-old Best playing for Cregagh Boys' Club. I once said Gazza's IQ was less than his shirt number and he asked me: "What's an IQ?" I'd give all the Champagne I've ever drunk to be playing alongside him in a big European match at Old Trafford. 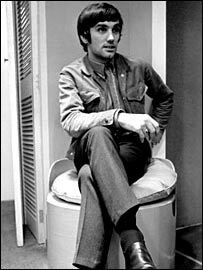 George Best - ever the joker. I was in for 10 hours and had 40 pints - beating my previous record by 20 minutes. Best on the blood transfusion after his liver transplant. He's not George Best, but then again, no-one is. The closest I got to him was when we shook hands at the end of the game. 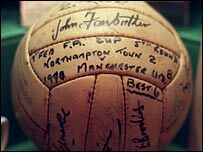 Northampton player Roy Fairfax, who had been marking Best when he scored six goals in an 8-2 FA Cup win for Man Utd in 1970. That's what children do - throw food. That's not fighting. We were real men. We'd have chinned them. Best gives his verdict on the infamous Battle of the Buffet between Manchester United and Arsenal. Shellito was taken off suffering from twisted blood! United team-mate Pat Crerand after Best had given Chelsea full-back Ken Shellito a torrid time. He's been very, very lucky, an average player who came into the game when it was short of personalities. He was able to use either foot - sometimes he seemed to have six. Sir Matt Busby on Best.